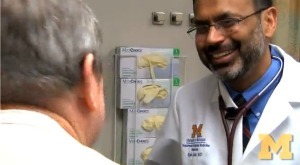 University of Michigan nephrologist Dr. Rajiv Saran leads effort to monitor chronic kidney disease in the United States. The University of Michigan Health System has been competitively re-selected by the U.S. Centers for Disease Control and Prevention to coordinate the nation’s first dedicated system to monitor chronic kidney disease. In the United States, 25 million to 30 million people may have chronic kidney disease — some of whom will eventually develop kidney failure and require dialysis or a kidney transplant to live. Public health experts believe the number of people with kidney failure will surge as diabetes and hypertension — the two leading causes of damage to the kidneys – increase among American adults. Blacks, Hispanics and seniors are at higher risk for developing CKD. “It’s hoped we can slow the progression of chronic kidney failure and head off the increasing number of adults who start dialysis each year,” says U-M nephrologist Rajiv Saran, M.D., MRCP, M.S., associate director of the University of Michigan Kidney Epidemiology and Cost Center and principal investigator of the project. “Monitoring is the first step in defining the magnitude of the disease that impacts quality of life, and can cut short the lives of many older adults,” Saran says. There has long been the United States Renal Data System, a dedicated system for closely monitoring population changes in advanced kidney failure, also known as end stage renal disease. But no system existed to monitor data and trends in chronic kidney disease, which is often a precursor to end stage renal disease. The U-M will continue to partner with the University of California-San Francisco (UCSF) for the next five years on the “Establishing a Surveillance System for Chronic Kidney Disease in the U.S.” project. A second component of the project includes developing an easy-to-understand online resource to inform the public, physicians and policy makers about CKD. Arbor Research Collaborative for Health, a not-for-profit based in Ann Arbor, will lead Web site maintenance and improvement activities in collaboration with the U-M team. The awards bring a potential $900,000 per year in funding. “Our goals are to not only document the burden of CKD and its risk factors in the U.S. population over time, but also to track the progress of efforts to prevent, detect, and manage CKD and its complications,” Saran says. Kidneys release needed hormones and regulate chemicals in the blood such as sodium, potassium, phosphorus and calcium but their most important job is removing wastes and fluid from the body. Damage to the kidneys can result in high blood pressure, anemia, weak bones, poor nutritional health and nerve damage. Dialysis clears away toxins in a way kidneys no longer can. More than 110,000 new patients start dialysis each year but an analysis by the University of Michigan Kidney Epidemiology & Cost Center showed patients who receive early nephrologist care have lower death rates and delay the need for dialysis. According to the National Kidney Foundation, the earlier kidney disease is detected, the better the chance of slowing or stopping its progression. The team of U-M researchers includes experts in kidney disease, diabetes, public health, and biostatistics. Additional U-M investigators in the study include Vahakn Shahinian, M.D., M.S., a nephrologist and associate professor of internal medicine; Michael Heung, M.D., M.S., nephrologist, assistant professor of internal medicine and director of the inpatient dialysis program at the U-M Health System; Eric Young, M.D., M.S., William Herman, M.D., M.P.H., endocrinologist and director of the Michigan Diabetes Research and Training Center; Brenda Gillespie, Ph.D., associate director of the Center for Statistical Consultation and Research at the U-M; Yi Li, Ph.D., director of the U-M Kidney Epidemiology and Cost Center, and formerly of Harvard School of Public Health; and Hal Morgenstern, Ph.D., professor of epidemiology and environmental health sciences at the U-M.